As a travel writer who loves the salt of the sea, the warmth of the afternoon sun and the drama when the orange orb sets in the evening, my taste tends to be for Mediterranean destinations. Imagine my delight this winter when I did not have to cross the seas to satisfy my longings for a touch of European ambiance. 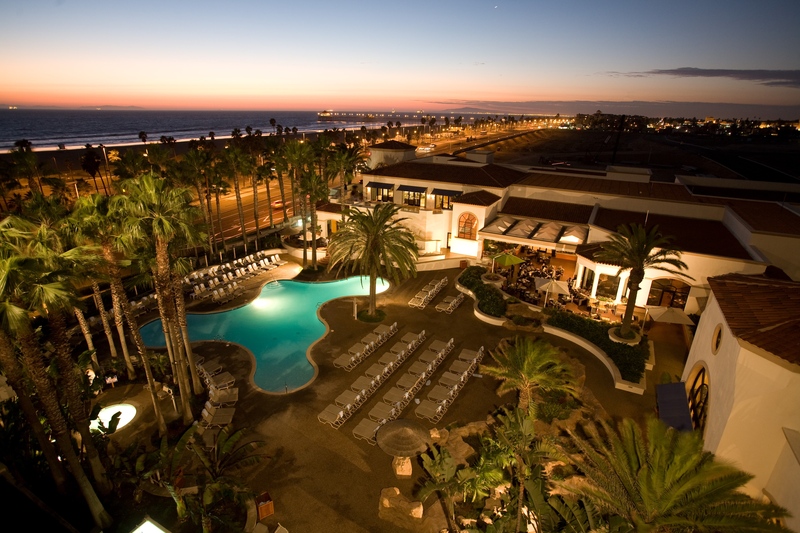 I found the perfect atmosphere and unparalleled service at the Waterfront Beach Hilton Hotel, Huntington Beach, California. Long a favorite of locals, Huntington Beach is a superb choice as a travel destination, no matter what time of the year, but for those of us who live in the Northeast, it is an ideal choice in the winter. The architecture of the resort has a Mediterranean feel sprawling over more than 22,000 square feet of indoor and outdoor space of understated elegance. Poets use a bridge as a metaphor for paradise and to reach it, one must cross over. I wondered if the hotel’s architects had this in mind, because to experience the beauty of the Pacific Ocean, one must take a short walk over a bridge. Once over, you step onto a lovely beach that seems to go on forever, and literally stretches over ten miles. If you do not care to head directly for the beach and wiggle your toes in the sand, as I did shortly after I checked in, (I could not restrain myself—I walked in snow that morning) you can stroll along what is said to be the longest concrete pier in existence. The Waterfront Beach Hilton Hotel is owned by the Mayer Family and is incorporated as MayerCorp.com. It opened twenty-five years ago, and plans are to open another complex near by the summer of 2017, featuring two hundred luxury rooms and a roof-top terrace and event space. The new complex will accommodate the many visitors–local, national, and international–who see Huntington Beach as a popular travel destination as the hotel is ideal for escapes, family holidays and conferences. Huntington Beach is famously known as “Surf City, USA,” and epitomizes the “California Dreaming” ideal of endless sunshine, endless summers, and wide, sandy beaches. All your shopping and entertainment needs will be met on the town’s famous and very lively Main Street, home to a dazzling variety of cafes, restaurants, boutiques, surf shops and street fairs. Music plays from all the clubs and pubs, setting the atmosphere for the vibrant Huntington Beach lifestyle, all just a short walk away. I was visiting relatives who lived in nearby Newport Beach and Laguna Woods, and I found it very convenient to invite them to join me for breakfast and lunch. It was a very relaxing way to catch up on each other’s lives in a serene atmosphere while enjoying the freshest and most delicious food; we had a choice of dining outdoors by the pool or in the spacious dining room. It was my birthday and we celebrated with lunch. The Caprese Sandwich recommended to me had buffalo mozzarella, tomatoes, basil pesto, mixed greens and prosciutto on a ciabatta roll and was indeed a tasty treat; my brother said he would come back to the hotel just for the Shades Pub Burger, and my cousin confessed she was now “hooked” on the fish tacos. 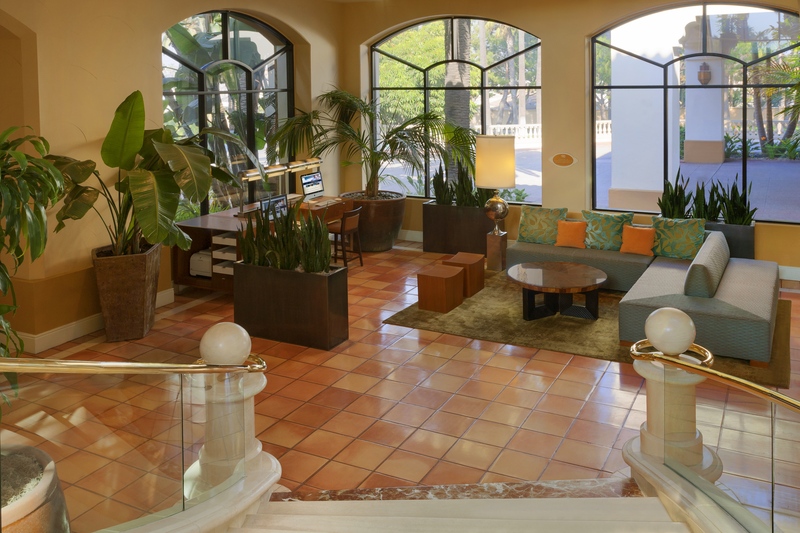 The Waterfront has an arrangement with its neighbor, the Hyatt Regency Huntington Beach Resort and Spa, for its guests to use the facilities of the Pacific Waters Spa and I took advantage of this. (Why not treat myself to a birthday gift?) Did I mention the hotel’s service is impeccable? When I asked about the Spa, the concierge called and made the appointment and within minutes a golf cart was there to drive me the short distance to the Hyatt. I was greeted by Claudia Hiatt, Spa Group Concierge, who showed me to a locker for my fluffy robe and slippers and then to the steam, sauna, and whirlpool. Bliss. The Spa itself is worth the visit to Huntington Beach. The architecture is Spanish with an Andalusian flair and has the feel of a private estate. After my treatments, I relaxed alone in a private courtyard with lush, tropical foliage, soothed by the sound of falling waters. I read for more than a hour. When I was ready to leave, the golf cart awaited me and I was so relaxed that I took a nap and did not want to leave my room upon awakening. I ordered a light meal of crab cakes, melon salad and wine, and as I finished there was a rap on my door. I was not expecting my brother or cousin and when I opened the door, a waiter stood before me holding a tray and asking if he could come in. He placed the tray on the table and removed the cover to reveal a large piece of very sumptuous looking chocolate cake. There was a note and I opened it to be wished “Happy Birthday” by Tammy Thurlow, the chef concierge. I will always remember my birthday at The Waterfront Beach Resort. After a perfect day with my family, relaxing hours at the Spa, an evening meal and dessert that just “hit the spot,” I snuggled under the sheets and comforter and had one of the best sleeps in recent years. The next morning when I checked out I mentioned to Ms. Rachel Butler, the morning concierge, that I had a wonderful stay and that the bedding was unusually comfortable. She said each room has the “Hilton Serenity Collection” bedding and the purpose is to “make each room a sanctuary.” I told her the purpose was achieved, indeed, and the comforter and other bedding had to be the best on the market. I asked if it was possible to buy this bedding for my home, and she said this is a frequent request of guests and gave me links to websites. The order has been placed and I await delivery. I will not be able to hear the sound of the Pacific Ocean from my room at home, but I can snuggle under the softness of my very own “Hilton Serenity” comforter. If you cannot go to the sanctuary, you can make the sanctuary come to you. It is a way of crossing the bridge to your very own idea of paradise. Good Night and Please Do Not Disturb.